We could all use more down time. But in the backcountry you have to go up first. 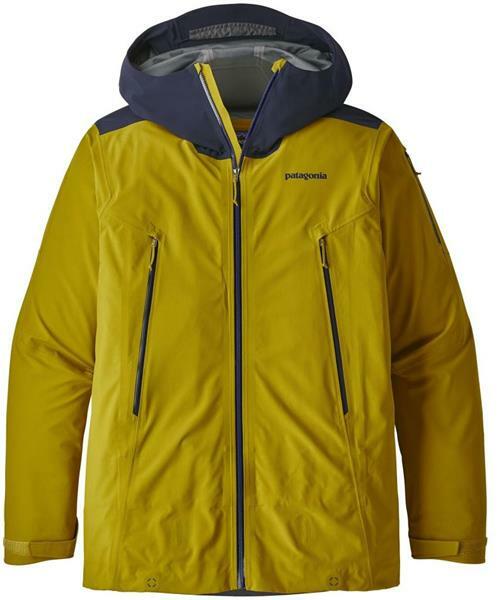 So Patagonia built the Descensionist Jacket to match the backcountry’s ever-changing conditions—no matter which direction you’re traveling. It’s their most breathable waterproof shell, made of a supersoft, 50-denier plain-weave fabric with mechanical stretch to keep you in motion throughout the day; a DWR (durable water repellent) finish protects the fabric from saturation due to blowing snow and spitting graupel. The soft, moisture-wicking interior glides over underlayers and moves moisture when your body is breathing from the inside out. The helmet-compatible, 2-way-adjustable hood has a soft, laminated visor to preserve visibility in wind-pushed snow along with the Cohaesive® cord-lock system that embeds cord locks in the hood and hem to eliminate loose ends and provide easy adjustability. Coated, watertight slim zip installation of Vislon® zippers reduces bulk and weight, and provide exceptional storm protection. When it blows outside, a fully adjustable powder skirt cinches to create a tight seal against spindrift and flyaway (includes a webbing loop that attaches to any Patagonia® Snow pants). Pockets: two mesh-backed front pockets (placed for easy access while wearing a pack); one bicep pocket on the left arm; one internal mesh drop-in for goggles and gloves; and one internal stash (secures with a zipper). Includes an embedded Recco® avalanche rescue reflector.